I wanted to continue our subject on faith. Hebrews 11:2 says: By it (Faith) the elders obtained a good report. The report card at the end of our life will be based on our faith, whether we kept the faith or not. Paul said in 2 Timothy 4:7: I have fought a good fight, I have finished the race, I have KEPT the faith. Faith is so huge in God’s eyes that He said that it is impossible to please Him without it. That gets every bit of my attention, how about you. I can not give God rest until He teaches me everything about it and gives me the grace to live by faith. In the book of Isaiah 62:7 we are admonished to give God no rest. The bible says that the just shall LIVE by faith. Jesus was very displeased when He found no faith and also marveled when He found great faith. Another fact about faith is found in Hebrews 11: 3 which says that through faith we understand. Understanding comes by means of faith. No faith no understanding. In Matthew 13:19 Jesus said something so great that when ANYONE (no respecter of person) hears the word of the kingdom and UNDERSTAND it not then the wicked one comes and snatches it away. Do you see why in the book of Jude we are told to contend earnestly(with everything in us) for the faith that was once delivered unto the saints? Because God knows that no faith means no understanding which means it doesn’t matter how much word gets sown in your heart, if you don’t undersatnd it; satan will steal it and you will never produce fruit. Beloved i hope that i encouraged you to dig deep into this subject because frankly i don’t think you have a choice not to; unless of course if you will be happy with a bad report at the end of your time. Father, you said to us in your word to take deep roots downward that we may bear fruit upward; we want to bear fruits of faith O God and we have come today before your throne of Grace to obtain mercy and find grace for this time of need. We ask this in the name of Jesus. I invite you today to be like a child for a moment as we look into God’s word. The faith of a child believes the word of God because it is the Word and because we know that it is impossible for God to lie(Hebrews 6:18). The bible says also that let God be true but let every man be a liar (Romans 3:4). All things means all things isn’t it. The bible says that the Spirit of truth, when He comes, He will lead you into all truth(John 16:13) and in another passage it says that the Helper, the Holy Spirit, He will teach you all things. (John 14:26) Now I beg of you, pause for a moment and think about those words. Have a selah moment. Has the Spirit of truth come to you? If not, take this minute and ask Him to come. This scripture like the rest of God’s word changed my life, it removed every limitation I placed on God and myself. He can teach me all things??? There is no limit of what i can ask him, what i can learn from him. That is heaven on earth. I think sometimes we read the bible too fast and we don’t stop to think about some statements that it makes. Let us look at another one. The bible says that you have an anointing from the Holy one and you know all things. (1 John 2:20) Now if i told that to my children, they would just believe it. And the bible said that blessed is she that believed because there shall be a performance of those things which were told her from the Lord. (Luke 1:45) The proof of true faith is that there is a performance of those things that we believed when God said them. I pray this day that the Lord will give all us faith that of a child which is not crowded with doctrines and commandments of men; faith that sings that old hymn which says: “God said it, I believe and that settles it for me.” With this I can assure you that your knowledge of God himself and his word will grow exponentially, when you decide to keep it simple as a little child. Father give us the grace to believe your word in Jesus name. Amen. I am thinking this morning how personal our walk with God is. In Hebrew, the twelve chapter we are admonished to run our race looking unto Jesus who both authored and perfected our faith. It is hard to both look at Jesus and look at other things as well. I am hoping to talk today though about the weight and especially the sin that so easily beset us because this verse is the prerequisite of running our race. The weight of course is anything that drags us so we are not fit to run but what is more on my heart is the sin. Sin means missing the mark. To hit the mark means not to sin and that is why God designed our walk to be so personal because He wants us to hit the mark. If Satan will not keep a person from running their race, he will bring distractions to delay them or get them out of the race. The bible says that if you have faith, have it to yourself before God(Romans 14:22), if you have wisdom, have it to yourself(Proverbs 9:1). Faith itself means steadfastness, to be unyielding, not turning to the right or to the left, not looking back like Lot’s wife. Paul said it this way: I press toward the mark for the prize of the high calling in Christ Jesus(Philippians 3:14). As we have traveled in many places, I have been amazed to see how people are not focused on running their race and finish their course. They are distracted by trying to discern whether Joel Osteen, Benny Hinn and many others who may not have good search results on Google, whether they are servants of God. Friends, can’t you see that this is a distraction, don’t you have enough on your plate. The bible says in Romans that every servant stands or falls before his Master(Romans 14:4). We are encouraged also to study to be quiet (1 Thessalonians 4:11) Peter had just received his own calling and commission from Jesus and yet he still wanted to know what John was to do. To this Jesus answered and said:” What is that to thee, follow thou me”John 21:22. 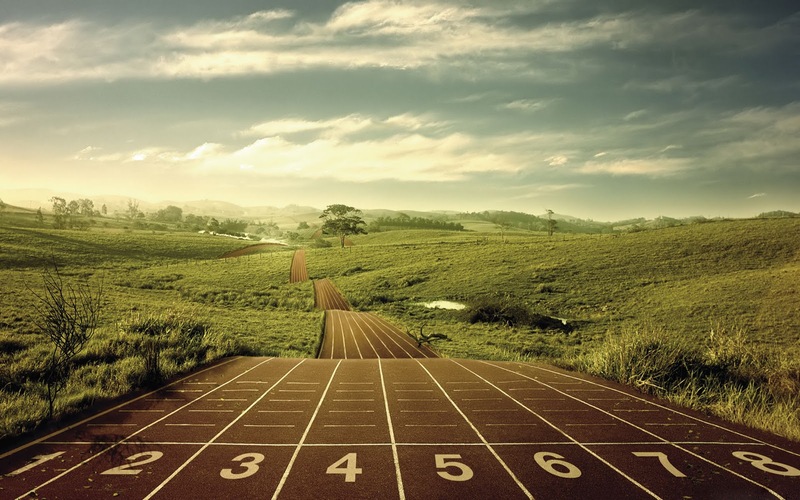 In the natural it takes a great deal of focus to run and obtain the prize, my prayer today is that you will not be distracted from first knowing your calling and running your race as to obtain the prize . Father, give us the grace to stay focused to the task you have given us and to not give in to manifold distractions set in our path. In Jesus name I pray and believe. Amen. I just want to share a quick story which I think has a huge lesson in it. There was preacher who really loved the word of God and one time Jesus(the resurrected Christ) appeared to him and was talking to him about something. Now this is what the preacher answered: Jesus, even though I see you face to face, I will not accept what you are saying unless you give me scripture to prove it. Jesus did not get angry and say how dare you question my theology but actually smiled and told him that even though in the mouth of 2 or 3 witnesses every word is to be established(2 Cor. 13:1), He was going to give him 4 of them to prove his point and He did. The bible says that let God be true and every man be a liar (Romans 3:4) and also that therefore I esteem thy precepts right concerning everything (Psalm 119:128). Would you like to be a noble man or woman? The bible says that the people of Berea were more nobles because they searched the scriptures to see if the things preached were so (Acts 17:11). We are also admonished to speak as the oracles of God 1 Peter 4:11). We have got to read the bible until our vocabulary is so influenced by the word, until we become walking, talking bibles. People who open their mouth and the scriptures leap out. John the baptist of whom it was said that there was none greater than him among those that are born of women, looking at Jesus (the word) said I MUST decrease and He must increase. Friends,we must esteem highly what the bible says over the doctrines and traditions men. If God’s people will read the word as they ought all the controversies will disappear. BUT what saith the scripture: Should I dance to the Lord? should i speak in tongues? should I prophesy? should I homeschool ? and the list goes on. Let me encourage you to search the scriptures and all the doubts will be no more. Father we are in need of you, come to our help we pray in Jesus’ name. Amen.